Homepage Knowledge Centre Blogs How can the workplace motivate and engage employees? 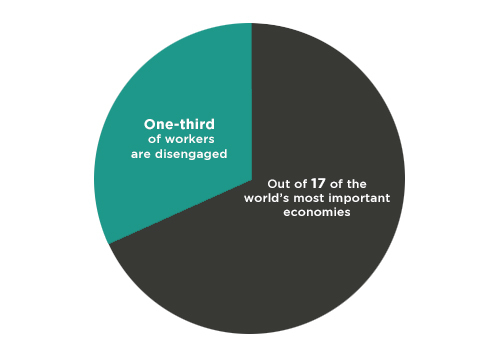 A third of workers in 17 of the world’s most important economies are disengaged, claims Steelcase in a new study of 12,000 employees across 16 countries. Figures like these illustrate just how few are failing to connect with their staff. Globally, employee engagement is a big problem for businesses. So what can employers do to help motivate and engage workers? Businesses need people who come to work energised, ready to generate new ideas, create new strategies and make meaningful progress every day. We believe the workplace can make a real difference. The environment staff work in every day has a direct influence on their output at work. For example…when arriving at work, what sort of energy does your reception area give off? Is it inspiring and full of colour, with friendly and enthusiastic individuals ready to welcome and motivate the team for the day ahead? First impressions matter, both for external visitors to the business as well as your own staff. Promote Optimism: Foster a culture of creativity and innovation in your business. Studies show that when in a positive state of mind, individuals are more creative, collaborative and open to new ways of doing things. A business depends on the optimism of its staff in order for them to be at their most productive, so chose a workplace that reflects this. Offer a variety of different meeting areas and work spaces for your staff, using products such as the impressive ClickShare – a meeting facility that allows up to 8 members of staff to plug into easy-to-use technology and work seamlessly with colleagues from one screen. Encourage Mindfulness: Guide your employees by helping them to stay engaged while at work. Provide them with spaces for whatever they may need, whether that’s a collaborative space or somewhere private to concentrate. We have a wide range of products which are perfect for giving individuals some privacy, from the fantastic flexibility of the ‘For Us Wall’ to the acoustic lighting of ‘Under The Bell’. Value Authenticity: Be true to yourself and create relaxed, homely spaces for your staff to feel comfortable in expressing themselves and their ideas, too. Take inspiration from home comforts – this helps to convey the message that staff don’t need to leave the office to switch off. The boundaries between work and home life have blurred, with emerging office designs reflecting home environments, such as big rugs, warm lighting and the use of natural wood. Foster Belonging: The so-called ‘third space’ is an emerging design concept that is really gathering pace. Social connections are important for a sense of belonging and engagement at work, but rather than let staff seek this elsewhere, many businesses are creating a café culture within the office itself. Why not visit our workcafe to see for yourself. Give Meaning: It is important for your staff to feel a sense of purpose at work. As a business, the workplace is an opportunity to express your personality and brand. Be proud of your values and reflect your brand throughout the workspace. Doing these things helps to reinforce your brand and underpins why you are doing what you are doing as a company. Vitality: Get up and go. Encourage movement in the workplace for an active and engaged workforce. Create health initiatives, such as ‘Fruit Fridays’ and encourage sports teams and running clubs for staff. Try holding standing meetings – perhaps in your work café, a reception area or even a quiet corridor – or give walking meetings a go. Alternatively, take it a step further and try a Sit & Stand desk. These height adjustable desks are extremely versatile and flexible, giving users the opportunity to increase their movement with ease.